What a shame to have to start off a blog this way! But I can’t help it; something special’s been lost, and I’m compelled to document. 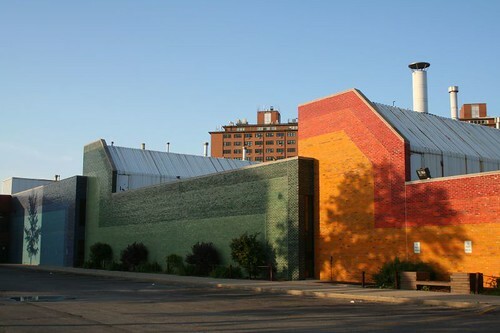 This was the New City YMCA, a circa-1981 building on Halsted just south of Clybourn, west of downtown, just north of infamous Cabrini-Green. 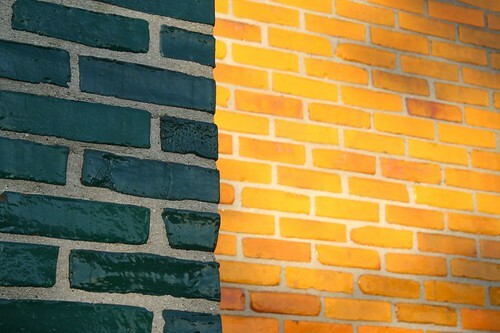 Not much of a building, but oh, those bricks, those glossy glazed bricks!! 9 shades of rainbow-colored glazed bliss. They’re tearing it down right now. There’s not much left, just a few partial walls and a huge pile of debris. This entry was posted in demolition, Midcentury Modernism. Bookmark the permalink. Any word on where the bricks are going? I hope not just to a landfill. 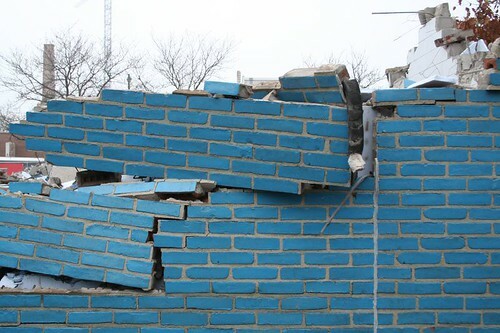 Hopefully some wrecker salvaged those bricks; my guess is that those were custom glaze shades. Some of the bricks were being palletized, so yeah, somebody wanted them.Others wound up in the rubble heap. I snagged a few blue ones this afternoon and hope to get the sunset colors tomorrow morning. The green’s all gone, far as I can tell.A sign on the site says that 90% of the building will be recycled, but doesn’t elaborate. Why recycle what already works?